The Proper Marmalade Company Blog – Tagged "jam"
Cranfields' on Kirstie's Homemade Christmas! Crafty Kirstie Allsopp is back for a spectacular 3-part special that will see her create the perfect homemade Christmas. Earlier this year, Kirstie turned her dilapidated Devon cottage from a shell to a chic vision of country living. Now, with the festive season just round the corner, Kirstie’s Homemade Christmas will see her use Meadowgate as a base to take viewers on a yuletide journey of decorating, wonderful gifts and perfect entertaining. Kirstie will be embracing crafts from around the country and her own love of doing up and making do to create the perfect Homemade Christmas. 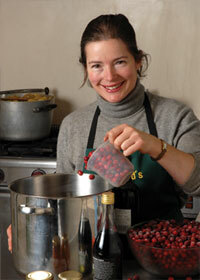 Among the craftspeople taking part in this festival of craft is Victoria Cranfield of Cranfields Foods in North Devon who shows Kirstie how to make Cranfields’s Boxing Day Chutney and Cranberry and Mulled Wine Relish for Kirsties hamper and the Christmas table. Packed with brilliant tips and information, the series will be a goldmine of great and creative ideas that the viewers can replicate at home. Each day, Kirstie will take on a theme and offer viewers the perfect guide to transforming any home into a Christmas spectacle – from Christmas decorations and hand- and homemade presents, to perfect Christmas entertaining with plenty of food, drink and general merriment.